Let's go to Wine Country! The Tour de France is passing by Languedoc right now. Apparently the two leading riders, both British, are getting bitchy on Twitter, no doubt because they can see all this great, affordable wine but their trainers probably don't allow them to drink it. I thought I'd suggest a few wines that the support crews are probably drinking right under the noses of the angry cyclists. The 13th stage was in Le Cap d'Agde, near the region of Picpoul de Pinet, a large region that produces some excellent and some OK versions of summery wines from the high-acid Picpoul grape. 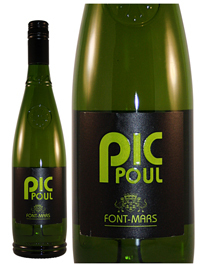 Picpoul is also the base grape of Noilly Prat Original Dry Vermouth, both because it's from the area near the Mediterranean and because even after two years of oxidizing in old oak barrels in the hot sun by the sea, it doesn't lose its acidity. In fact, the word "Picpoul" means "lip-stinger." Chateau Font-Mars Picpoul de Pinet 2011 ($12, buy here) is a nice version of this crisp, refreshing wine: lean, green and minerally, and it seems to get stonier in the mouth. Try it with shellfish. 12.5% alcohol. The riders then travel through the La Clape region, which is one of the top crus of Languedoc. La Clape is better known for red wines but the whites are made mostly from the rare Bourboulenc variety, which is interesting. It's saying something about the prices of Languedoc wines that a white wine from a top region sells for $15. Chateau de la Negly "La Brise Marine" La Clape Coteaux du Languedoc 2010 ($15, buy here) has Marsanne and Roussanne, two common Rhone grapes, blended with the Bourboulenc, and you can taste their influence. It's floral and much softer than a Picpoul, with golden apple and white peach fruit. The winery makes it from only free-run juice, which is amazing in this price range. You'd want to have it with roast chicken. 13.5% alcohol. From La Clape, the riders push it through the Corbières region, which is definitely red wine territory. Chateau Trillol Corbières Grenache-Syrah 2008 ($10, buy here) is an example of how good red wines from the Languedoc can be at a price where, let's face it, California is selling you what's left over in the tank when the best grapes have been placed elsewhere. The Chateau is at 1,300-feet elevation, which probably has a lot to do with the complexity of this wine. It's spicy on both nose and palate, with ripe red plum fruit (it's 14% alcohol) that will appeal to American drinkers and a cinnamon/black pepper note that makes it great with barbecue. I drank this with ribs on Bastille Day; Vive la France! Bergerie de l'Hortus Pic Saint Loup 2009 ($14, buy here) is another wine ripe enough for the American palate that retains its French soul. It's a Rhone-style blend of 60% Syrah, 30% Grenache and 10% Mourvedre, but the result is surprisingly seamless, with juicy ripe red currant fruit. Even in a ripe vintage (13.5% alcohol), it retains its acidity. 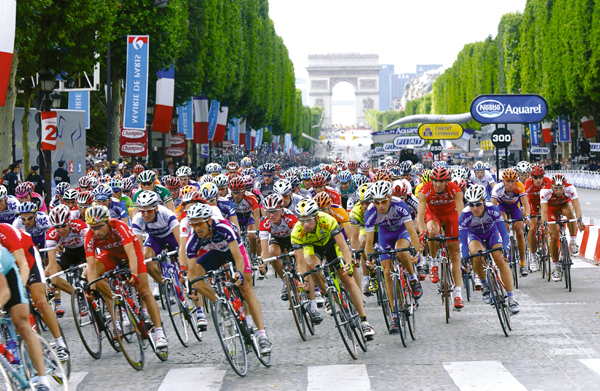 The 14th stage finishes in Limoux, home of the oldest sparkling wine in the world. Monks at the abbey produced bubbly in 1531 and the locals still take umbrage at those upstarts from Champagne. It's way too early to celebrate winning the Tour, but Blanquette de Limoux, made mainly from Mauzac, is priced to celebrate minor triumphs, like just finishing a stage, or maybe fixing a flat tire. For bubbly purists, "nature" means it's made with no added dosage, so it's lean, but once your palate adjusts the green apple fruit is quite refreshing and the minerality on the finish shows well. It doesn't do well in mass tastings because wines with residual sugar make it taste more austere than it is. I thought it might need food to show its best, but in fact I'm drinking a glass of it as I write this. A great hot-weather porch bubbly to start your evening, and pretty hard to beat at this price. Now doesn't that make you want to jump on your bicycle and race to the store for some wine? 2) Slovakian wines, specifically, Reislings? Lisa: Offhand I can't remember the last time I wrote about these. I am a big fan of screwcaps for wines meant to be drunk soon, and prefer cork for wines meant to be aged 10 years or so. I don't like plastic corks in any circumstances. I tasted some Slovakian Rieslings blind as part of a panel at the Concours Mondial and liked them, but had no information about them and really know nothing about the topic, sadly. However, the Concours is in Slovakia next year so hopefully I'll know a lot more after that. I believe you have also supported some boxed wines in the past, no? Oh yes, big fan of the format of bag-in-box wines, they stay good in your fridge for 2-3 weeks, are much cheaper per ounce and are better for the environment because they're less heavy to transport. The problem is that the industry doesn't always put the best product in them. But when you find a good one -- Black Box Sauvignon Blanc is pretty good, nice hot-weather wine -- they're great value. The bag makes a huge difference. It compresses as you drink wine, preventing the wine from being exposed to oxygen. This is why bag-in-box wines last a lot longer than, say, a juice box full of wine would. Box wines, unopened, do NOT last as long as bottles, because the plastic bag is more permeable than glass. They have a shelf life of maybe a year. Less than 2 years. If you have one that old, dump it. But opened -- now that's where bag-in-box wines have a huge advantage. Store it in the fridge, even reds, and you should get at least 2-3 weeks of freshness, whereas a recorked or recapped bottle will only last 2-3 days. This was a witty, succinct and informative post...it made me laugh and educated me a bit too. My friend is following the Tour right now in France and I sent it to her. Thanks!